If you’re the type to contemplate the stories behind buildings and locations, this may be of interest to you. If you’ve done so from the vantage point of the Soldiers and Sailors Monument looking northeast, this is specifically for you. In 1865, the Journal Company purchased the adjoining property to the north from First Presbyterian Church–the church’s second location– for $18,000. The congregation’s cornerstone had been placed at their home on the circle on October 7, 1842 and their last service there was April 1, 1866. 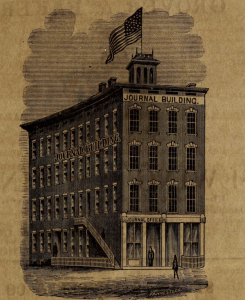 In the spring of 1874, an addition to the Journal building was announced. It is likely that the building grew to a wider five stories soon thereafter, as the city directory called the place the “new Journal building,” with it listed at the same location. At the time, it was the tallest commercial building in the city. In 1893, the building was purchased by Philander Fitzgerald, who renamed the building after himself. 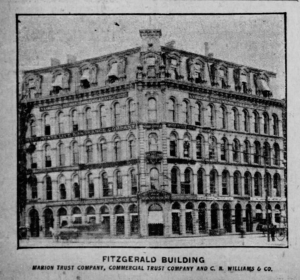 It was known as the Fitzgerald building until the real estate next changed hands and looked more like the image below, with a mansard roofline and five stories. In 1904, requests appeared in the papers for proposals from architects to remodel the building with an additional two floors. This must have dismayed locals, who–more than once–wrote the newspapers to comment on how the “five story ivy wall on the Fitzgerald” was a favorite and one of the prettiest downtown features. 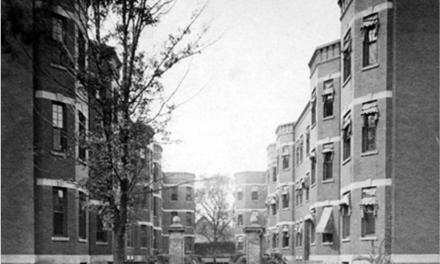 The Fitzgerald was clearly ahead of the curve with “greening.” A 1905 newspaper noted the remodeling and addition of one story to the building, showing that back then, as now, what is planned and what is realized are not always the same thing. 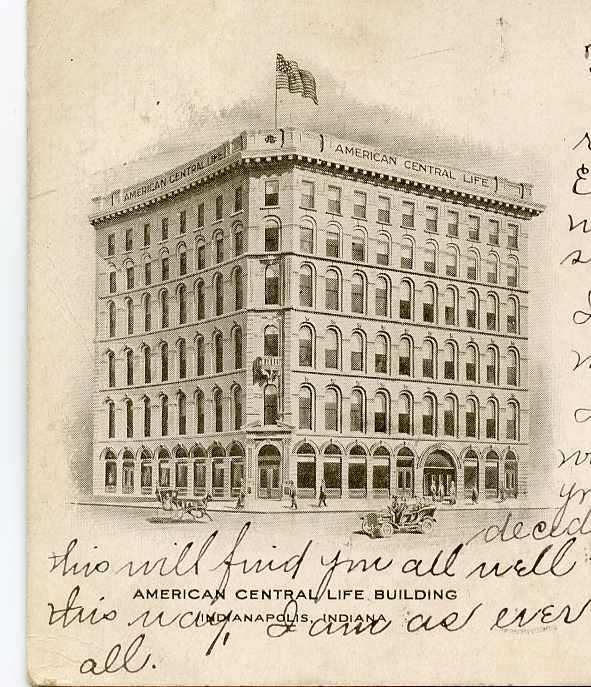 On November 1, 1905, American Central Life took possession of the building, giving the building its final name change: the American Central Life Insurance building. 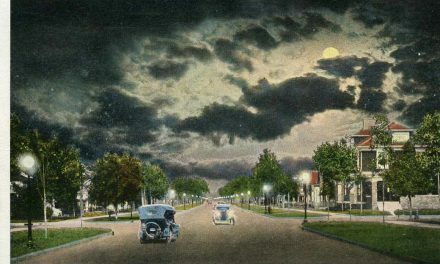 As time gave way to the inevitable “progress,” the northeast quadrant of the Circle housed the three oldest buildings to front the circle. 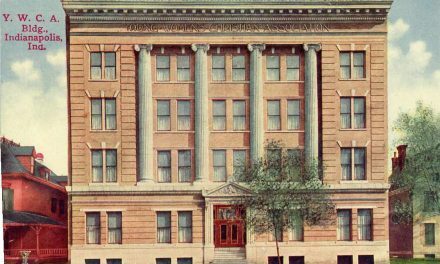 By 1959, the American Central Life building was gone, and Christ Church Cathedral was the lone oldest building on the circle. 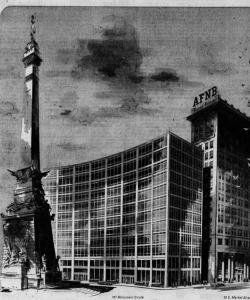 The American Fletcher National Bank & Trust Company eventually acquired its next door neighbor, American Central Life Building to the immediate west of their headquarters on East Market Street. They also purchased the Indianapolis Water Company property north of the Journal/ Fitzgerald / American Central Life building. This was an era of change and acquisition on multiple fronts; American Fletcher National Bank & Trust Company was the result of a merger between American National Bank & Trust and Fletcher Trust on December 31, 1954; then that company merged with Fidelity Bank and Trust Company before the new building opened. 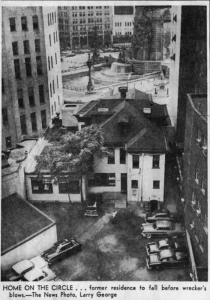 Incidentally, when the Monument was being constructed, the statue of Victory reportedly rested between the water company building and the American Central Life building before finally making it to her permanent residence at the top of the monument. January 29, 1958, the wrecking crews started destroying the former Journal building, and the old home behind the commercial facade next door (above). It was reported on March 12, 1958 that the last of the property would be gone by the end of the day. The replacement “Fidelity” building was built between 1958-1959, designed by Skidmore, Owings and Merrill. The aluminum and glass building reportedly cost $2.5 million to build. The general contractor was the George A. Fuller Co, of New York; the plumbing, heat and air conditioning was installed by Freyn Brothers; Henry C. Smither Company provided sheet metal roofing. Today the building that stands in the northeast quadrant of Monument Circle bordering Market Street is a curtain of reflection, best used to find a fresh angle of the circle, IMO. It’s the squat part of what is now Sales Force Tower. The twelve stories now on the site doubled the height of the former building. And yet, I’d still prefer to have the shorter, older one. How about you? Does this prompt any other questions about this place? PreviousHappy Birthday Virginia Keep Clark! 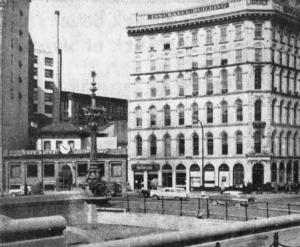 I remember the old Indianapolis Water Company building on the Circle very well. In the early 50’s, when I was a little girl, I sometimes visited my Dad’s office there. He worked in the accounting department of the Water Company and later became VP of the Indianapolis Water Company. Then the company built their offices on Waterway Boulevard on the West Side of Indy. I thought he told me one time that the little residence behind the Water Company was a Minister’s home at one time, but I’m not sure. I do remember that the courtyard behind that residence was paved with cobblestones. It was so neat to see this picture of a long, by-gone era! You are absolutely correct, the house behind the water company had been home to a couple of bishops, I believe it was–off the top of my head. Thanks for sharing! Very interesting article. 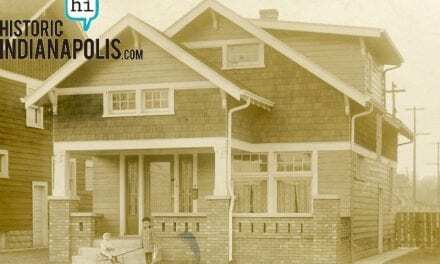 I never knew about that house on the Circle. I’d prefer the American Central Life Building as it looked in the photo just before demolition began.